I am a healthy 47 year old female. I have always been a good athlete and still am, thank goodness. I injured my knee on 01/26/08. Not skiing but weather stripping a door. The weather stripping was a little thick and the door wouldn't close, in my mind I thought "if I just give it a little kick it will close." Maybe too many Bruce Lee movies. The leg that I was standing on went pop pop and then I went down. My fiance heard me say "bad word" and said, "are you alright" laughing I said, "I don't think so." We off to the hospital needless to say and then to the Orthopedic doctor and then the MRI which confimed I had torn my ACL and had a meniscal tear and that surgery would be necessary. 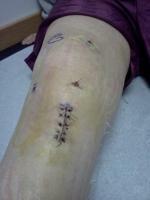 When I met with the Ortho doc he said 3 weeks of physical therapy and then surgery on 02/19/08. This I could deal with. The only part that was a shock was allograph or hamstring. Not knowing what that meant I was shocked to hear the word cadaver tissue. That is when I really starting thinking...this is serious. I began to read and finally decided on using my hamstring. I was surprised to talk with so many people who have had this surgery. The consistent things I heard where with the Patella graph the knee cap was still very sensative years after the surgery. Be a gardner I thought that's not for me. I had the surgery and came home that night from the hospital. My opinion, they should keep you overnight and sedated. The next 3 days were the worst pain I have ever felt. I being 115 pounds gave birth to a Son who was 9 lbs 2 oz, with no medication was a cake walk compared to the surgery. After the 3 days I stayed on pain medication for another couple of days. I had the immobilizer brace on for 7 weeks with PT 3 times a week. Once the brace was off I have continued with PT 2 times a week. I am still waiting to get clearance for jumping and pivoting but I have to say I feel really good. It has been an interesting process so far with some way to go. The only plea to the Doctor's and Insurance companies is to have a overnight stay so they can give the stronger pain medication. Good Luck to anyone who has to have this surgery and my only advise is listen to your Surgeon and go to ALL of your PT!